I will be putting scads of things in there over the coming weeks,, but the main focus I have been undertaking is getting lots of new pictures of all my jewelry that I will be offering and of my painted rock critters... so far I have about 18 items of jewelry in the shop and want to add some painted rocks soon.. I know times are hard and the economy has not made it easy on handcrafters .. but Please in the up coming Holiday season,, Won't you think about buying local handcrafted items for gifts this year... The big outlet stores are great for bargains but most of the items in these mega stores and you *know* who I am talking about.. are imported and that takes away jobs and income from Americans. Make a pledge to support the citizens in our country and buy local and or Handmade items... Good for our economy and our Country. 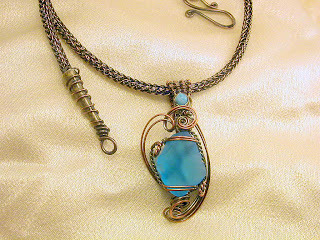 The chain is handmade from copper wire in 24 ga the Pendant in copper 20ga wire is a piece of beach glass I found and a little blue bead in the top swirl, I did a wire woven bail and the whole piece is meticulously handcrafted from start to finish... I even took the brass end cones and turned the edges over to make them smooth rounded and pokey free! Please feel free to take a peek at my shop and convo me if you have any questions about anything I offer.